Where heroes are often easy to recognize – firemen, police, 911 dispatchers, EMTs, rescue personnel, volunteers – sometimes corporations are not much appreciated. You deal with big oil companies raising gas prices based solely on speculation, banks taking back homes without working with owners to modify loans when they hit hard times, and corporate lobbyists that seem to own Congress. However, sometimes a corporation strips away the cynicism and really shines as an example of doing things right. It pleases me greatly to acknowledge Firehouse Subs and the Firehouse Subs Safety Foundation as a good corporate citizen. In addition to offering some really amazing sandwiches and a spiffy coke machine that lets you pick the special flavor of your drink, they allow customers to round-up their bill and then use these (and other) funds to give grants to emergency services groups around the nation. Recently the Firehouse Subs restaurant in Smyrna (even though we’d like to claim it as our own for LaVergne) sponsored the city to the tune of a $16,000 grant. The city purchased a six-wheel Polaris Ranger rescue vehicle with the money and now the north end of Rutherford County will have the ability to go to hard-to-reach places where people are injured and pull them out without having to wait for help to come from Murfreesboro. 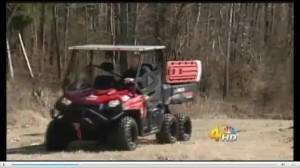 The photo of the Polaris is from a great story that ran on Channel 4. For this, we thank FIREHOUSE SUBS. Mark Watson, his wife, his staff, and everyone affiliated with the Firehouse Subs Safety Foundation, we want you to know how much we appreciate what you have done for our town and our citizens. I will go out of my way now to eat at Firehouse Subs because they care. They care about me, they care about my family, my neighbors, my city. Other corporations located in LaVergne should take notice of this powerful and extraordinary testament that our 32,588 residents are real and have value. Retail and businesses located next door should also take heed that reaching out to your neighbors by supporting our community is a smart move. There are plenty of opportunities for industry and businesses to step up in support of the city. I think having a playground named after you would be swell. How about a walking trail? An entire park? A community center? Despite a limping economy, our residents DO spend money. We buy clothes, food, new tires, books, cars, and other items. Who we buy them from could be up to you. Being a good corporate citizen to your own community or to people who bring you half your business should be a no-brainer. If you work at one of our local industries (Nissan, Bridgestone, Ingram, General Mills, Cardinal Health, etc.) then I ask you to take a moment and share this link with your company. Ask them to be a good corporate citizen on behalf of LaVergne. Great article full of great ideas. Many thanks to Firehouse Subs for your generous support and to you,Lola for bringing it to light in such a thoughtful way. I would love to see more community involvement from our local corporations. It would be such an asset to the citizens as well as the companies. I cannot think of a better way to show some pride and appreciation for the community and it’s citizens. Today I will go pick up an awesomely delicious sub from the fine folks at Firehouse Subs, and I won’t forget to round up!